Through this activity, kids will learn about the life cycle of a plant and discover what their plant needs to survive. They will also learn about innovative gardens that don’t require going outside. This activity showcases how agriculture and science go hand-in-hand. The activity was developed by the 4‑H Youth in Action Agriculture Pillar Winner, Serena Woodard. Cut the water bottle in half, horizontally. Remove the bottle cap and assist kids with cutting a small hole in the bottle cap. Cut a string that is about five inches long. Poke the string through the hole in the cap and tie a knot on the inside of the cap. Screw the cap back onto the top section of the bottle. Now, fill ¾ of the bottom section of the bottle with water. Take the top half of the bottle and place it upside down, inside the bottom half of the bottle. The cap should not be touching the water. Fill the top half of the bottle with soil. Press a bean seed into the soil and cover with about ½ inch of soil. Use the STEM Lab Notebook to explain the lifecycle of a bean. Encourage kids to use it over the coming weeks to record the changes in their bean! Try making a bean in a bottle that is hydroponic! Do this by replacing the dirt with perlite or gravel and add hydroponic plant food to the water. Use your STEM Lab notebook to make observations about how the plants grow. How does agriculture relate to science and why is it important that these fields work together? What did you learn about indoor gardening? How does the water get to your bean? What are other ways to be active in agriscience in your home? In the city? Brainstorm ideas. In the Bean in a Bottle activity, the string wicks water up into the soil to keep the plant moist. Water is made of cohesive and adhesive properties, which means that it “sticks” to itself and other special materials. This allows the water to be absorbed into the string; once the string has been completely soaked it will result in water droplets being left in the soil, where it can then be absorbed by the plant. The activity teaches the basics of plant life cycles, but it also teaches about hydroponics! Hydroponics is the process of growing plants in perlite, gravel or liquid, with added nutrients but without soil. There are lots of different hydroponic systems, but one of the simplest kinds uses water wicking, just like this activity. STEM is used on every farm and ranch, from tractor GPS systems to hydroponic systems. In Australia, it is estimated that 20% of the country’s vegetable production came from hydroponics in 2017! Download and print the PDF to easily complete the activity in groups. 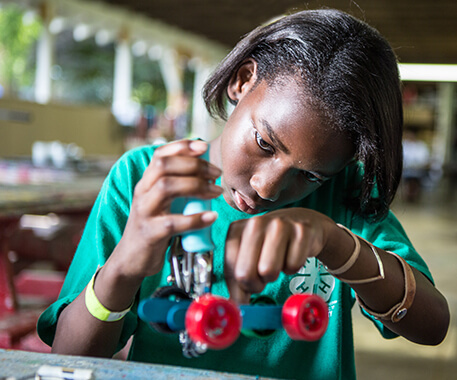 4‑H curriculum promotes positive youth development through experiential learning. We believe that kids retain more information — and have more fun! — when they are part of the learning process. All of our curriculum products contain this element of experiential learning. All of the curriculum goes through a rigorous peer review process, ensuring the highest quality of all of our materials.